I confess...I'm a big Dean Koontz fan. Every time a new Koontz thriller comes out, I eagerly rush out, purchase it, and read it in just a few days. His books have always had interesting twists and turns, good character development, and they're just plain fun. When I discovered The Darkest Evening of the Year, I was thrilled. 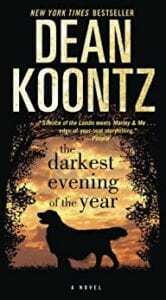 A new Koontz novel, and an added bonus: it features a beautiful dog. I love dogs, so the combination sounded perfect. Unfortunately, the book did not live up to all of my expectations. The Darkest Evening of the Year did provide some interesting plot turns and for the most part, was an interesting read. I was quickly drawn into the story and wanted to learn what evil was lurking just behind the door. The main characters are Amy Redwing, a dog lover who rescues golden retrievers, and a dog she finds in an abusive situation, Nickie, who enters the story in the first few chapters. There is something very odd about this wonderful dog, but what is it? This book is not one of Koontz' best. It's not unsatisfying, but it has a few flaws. It was a fast read and I truly enjoyed the plot. What I had a real problem with were the breaks in the story to preach about dogs and dog rescue. These frequent breaks completely killed the mood of the book and instead of being drawn into the mysterious world of Amy and Nickie, I felt like I was reading a manual on proper dog care. Yes, Mr. Koontz, I understand, you're a dog lover, as am I. But you don't need to preach, especially in a suspense novel. These interjections of "save the dogs" off-plot mini lectures really broke the flow of the story. For example, one passage read "Amy Redwing knew that dogs who were sent to shelters had little chance of ...." and then continued for over a page about the horrible fate of shelter dogs. Please leave the dog preaching to dog rescue groups and just tell a good story. I also found the ending weak and disappointing. It was as if the author suddenly got tired of the story and wanted it finished immediately. The way the book concluded left me wanting a more detailed explanation of what happened. Quill says: A fun read but definitely not up to Koontz's usual standards.